The I Ching or "Yì Jīng" , also known as the Classic of Changes, Book of Changes and Zhou Yi, is one of the oldest of the Chinese classic works. It is the most famous one among the Five Classics. The character "Yi" means change. It is a book about change: Things in this world exist naturally which is simple, while it's changing but stay unchangeable for the long run. -- by Zheng Xuan. Ancient king of Shang and Zhou dynasty depended on almost every aspects of their life upon tortoise shell or animal bones. After the divine, the workers carved the time, participant's name, divine content and also the results on the shell that came out the oracle. The divine contents included national events even private encounters as sacrifice, climate, wars, illness, journey, etc... The results could be propitious or ominous and that would be the guidance of people's choice and actions. 2900 BC-2800 BC: The Eight Diagrams was founded by Fu Xi. 2200 BC - 2100 BC: The Eight Diagrams was expanded into 64 Diagrams by Xia Yu. 1700 BC-1100 BC: (http://en.wikipedia.org/wiki/Shang_dynasty "Shang Dynasty" "Shang dynasty"): The order of 64 Diagrams was re-arranged and recorded in book of Gui Cang with hexagram responding (坤 kūn) as the first Diagram. 1100 BC-221 BC: The King Wu of Zhou, toppled the Shang Dynasty, his brother Zhou Gong Dan created Yao Ci and clarified the significance of each horizontal line in each hexagram until the whole context of I Ching was understood. ~256 BC: the hexagrams started to begin with Initiating (乾 qián). 206 BC-9 BC: Comments on I Ching which is Yi Zhuan together with commentaries by the well-known Confucius, I Ching is also often referred to as Zhou Yi. By the time of Western Han Dynasty, This can be deemed as the change of Zhou or the witness of the ups and downs of the several dynasties. after 1279 AD: study on I Ching of San Yi--three editions of I Ching--(Lian Shan Yi, Gui Cang and Zhou Yi) was established. This theory was considered core points of the Li, Xiang, Shu (essence content of Yi learning after Qin, Han Dynasty until modern times). From modern view, Li (means "theory" in Chinese) is among philosophy scope for the purpose of probing rules of change and unchanged things of universe and human life. Xiang is digging out the principle of change among mass phenomena in the world. Shu – analyzed and deduced by human, explained the reasons and consequences of things and deeds. 1960 AD till now witnessed series viewpoints by western and Chinese scholars. 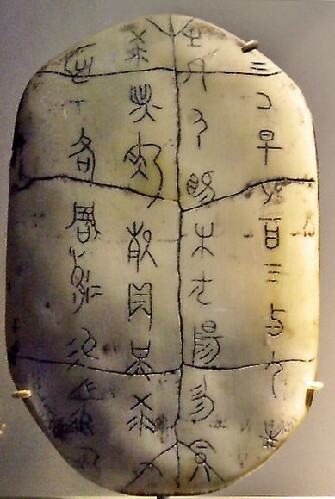 The earliest edition founded in a tomb discovery was composed in 2nd century BC, which is during late Zhou dynasty; this is considered evidence of the saying that I Ching was completed in Zhou Dynasty. Yi has basic compositions of Tai Ji which generates Liang Yi, Liang Yi generates Si Xiang, Si Xiang generates the Eight Diagrams which determine the good or ill luck; the good or bad luck leads to exploit. 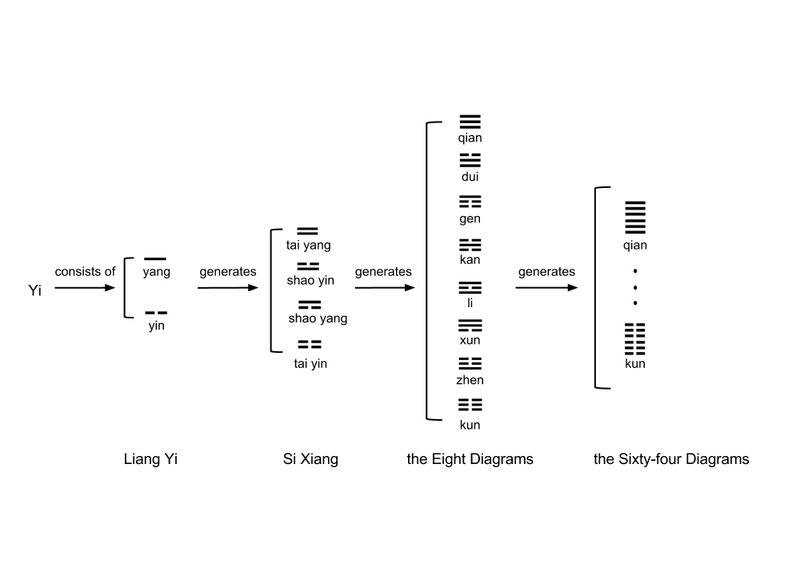 Later generations hold the view that the origin of trigrams is extended: Yi has basic composition of Tai Ji, Tai Ji leads to Liang Yi, Liang yi leads to Si Xiang, Si Xiang leads to the Eight Diagrams, the Eight Diagrams leads to hexagrams. Wu Ji represents one; Tai Ji means Yin and Yang which is two(Liang Yi); two splits into four that is Si Xiang(Tai Yang, Shao Yang, Shao Yin, Tai Ying); four splits into eight(the Eight Diagrams); eight multiply by eight, so there are 64 diagrams. The content of the I Ching consists of 64 sets of hexagrams. Each hexagram is combined with six lines with each line called "爻" (yáo) while representing Yang or Yin. With six lines stacked from bottom to top there are 64 combinations, also known as 64 hexagrams. The hexagram is composed of two three-line arrangements called trigrams (卦 guà). With two fundamental elements of yin and yang, there came out 8 combinations of trigrams. Yin and Yang is one of the most significant ideologies in ancient philosophy world of China and it is also the main thoughts and core part of I Ching. Diagrams of I Ching is based on two yáo symbols. Yin and Yang follow the principle of "eliminating and replacing between each other"and combine internally to form the Eight Diagrams. The arrangement structure and of the eight diagrams reflected the interaction and unity of opposites of Yin and Yang. Despite the basic meaning of masculine and feminine, I Ching explained quite abundant rules of changing and property of all things derived from theory of Yin and Yang, and also gave out new explanation both naturally and socially. Seen from nature phenomena: Yang stands for sky, sun, hot, bright; Yin stands for land, moon, cold and dark. From aspect of social phenomena: Yang stands for men, king and gentlemen; Yin stands for women, common people and little man. According to above, I Ching holds the tenet that no matter social life of human or natural phenomena, all have opposite facets, that is—Yin and Yang. Yin and Yang in I Ching is the foundation theory of Yin-Yang in TCM. Thought of "accurate time with fixed location" left great influence on TCM. Two notable therapy principles meaning "treating one patient using specific prescription"and "given etiology, giving out recipe" are all derived from thoughts of I Ching. It also set no small impact on formation of TCM terms as of Zi Wu Liu Zhu, Ba Gang Bian Zheng, Feng Han, Shu Shi, Zao Huo, Liu Xie and so on. Classic work of Huang Di Nei Jing is a typical one influenced deeply by I Ching. Authoritative TCM dictionary--Sheng Nong Ben Cao Jing in Eastern Han dynasty utilized idea of the Eight Diagrams and thus earliest foundation of traditional medical-taking was set up. Zhang Zhongjing—ancient medical scientist of China, combined Yin and Yang with Tai Ji in his book of Shang Han Lun for Liu Jing theory, which later on the base of clinical medicine was paved.